A rich and well surveyed overview of the current solo acoustic guitar scene, revealing a talented current generation of guitar players and their rediscovery of American roots music. Going deeper than the expected post-Takoma revival players, the compilation also serves up highlights such as the jazzy, Django-inspired Ava Mendoza, whose 'Regional Park Blues Between Hay & Grass' rounds off the album brilliantly. 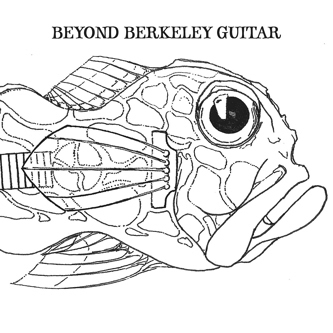 "Beyond Berkeley Guitar is the follow-up to 2006's Berkeley Guitar, which through the efforts of three young guitarists, exemplified a strong current of American Primitive guitar playing in Berkeley still thriving since the 1960's when Takoma Records was founded there by John Fahey. That album included liner notes by Takoma's Ed Denson, and the stunning CD and gatefold LP were designed by acclaimed painter and Baroness singer/guitarist John Baizley. Beyond Berkeley Guitar was curated and produced by Sean Smith, who also produced Berkeley Guitar. As the title suggests, Beyond Berkeley Guitar expands the boundaries, stylistically and regionally, to display the prowess of seven Bay Area guitarists, all of whom use solo guitar composition as a means of profound personal expression. This collection spans generations of players, from Aaron Sheppard, a twenty year old virtuoso fingerpicker, to Richard Osborn, a free-raga style player who studied with Robbie Basho in the 1960's. The album also offers the rare treat of hearing a woman represented within a genre dominated almost entirely by men; Ava Mendoza, whose wiley and highly technical playing closes the album. Included as well are two gentle players, Trevor Healy and Chuck Johnson, who both come from avant rock pasts; Lucas Boilon, who largely keeps his extreme talent to himself; and Sean Smith, who continues to stretch the boundaries of American Primitive through genre and influence re-appropriation."